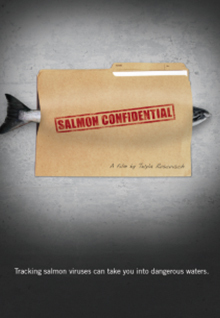 Salmon Confidential portrays the Canadian government’s response to the release of viruses from Atlantic salmon farms into the wild Pacific salmon habitat, which threatens the future of wild salmon in the eastern Pacific. The film follows independent biologist, Alexandra Morton from the courtroom, into remote rivers and shopping malls as she tracks the infectious salmon anemia virus, one of the most dangerous farm salmon viruses spreading worldwide in Atlantic salmon farms. Rare footage from a federal commission into the collapse of wild salmon in Canada provides surprising insight into the governments’ attempt to cover up the virus spillage from salmon farms.